Improve your ear by learning to recognize pitches in the context of a key. Use the radio buttons to decide if you want to practice in a major or a minor key, whether you want to use notes only from the tonality you chose or from all twelve notes of the chromatic scale, and whether you want to hear the scale or a cadence in that key as a reference. Choose the range (in number of octaves) from which you would like the note selected. 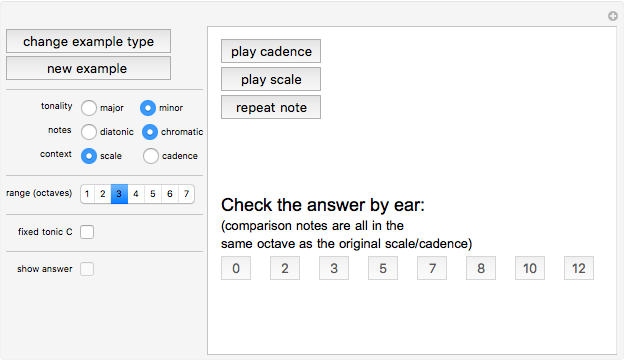 Click the "new example" button and the scale or cadence will be played, followed by a note selected at random subject to your restrictions. It is up to you to determine the note that was played. If you need to hear the randomly selected note again, click the "repeat note" button. You can check your answer by ear or you can have the answer displayed for you by clicking the "show answer" checkbox. 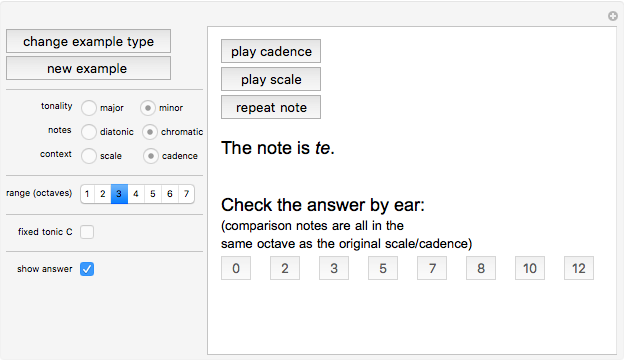 The "fixed tonic C" checkbox lets you always work in C major or to have the tonic selected at random with each new example. Notes are labeled using the traditional "movable do" solfege system—the notes of a major scale are named do-re-mi-fa-sol-la-ti-do regardless of which note is the tonic (first note of the scale). The notes in the natural minor scale are labeled do-re-me-fa-sol-le-te-do. The solfege syllables for non-diatonic notes (notes not in the scale) are less standard. Since we are working only on recognizing a single note in its relation to the key, we do not distinguish between a raised first scale degree and a lowered second scale degree or any other enharmonic equivalents (notes that sound the same but are spelled differently). The labels do-ra-re-me-mi-fa-fi-sol-le-la-te-ti-do are used for the notes of the chromatic scale. Marc Brodie "Recognizing Notes in the Context of a Key"